Scott Bryant recalled his 1980s college days in 2009, college days that included rituals before each game he played at the University of Texas. "I tended to be too superstitious," Bryant told Texas Media Relations. "Before every game I went to an old Whataburger on the Drag and got a cheeseburger, and then with the players, I got a Dr Pepper and a BLT. I always ate the same thing." Whatever his ritual was, it worked well enough for the Texas standout to be selected by the Reds in the first round of the 1989 draft. But they didn't work well enough for Bryant to make the major leagues. Bryant was taken by the Reds 20th overall that year. He had hit a team-high .385 at Texas with 18 home runs and 109 RBIs by June 5. He had been named the 1989 collegiate player of the year by the American Baseball Coaches Association. Signed by July 1, Bryant was sent to single-A Cedar Rapids. He hit .253 for the Midwest League Reds that year. He returned for the start of 1990, hitting .264 in 67 games before a promotion to AA Chattanooga. At Chattanooga, Bryant hit .313 the remainder of the year and .304 the next year. 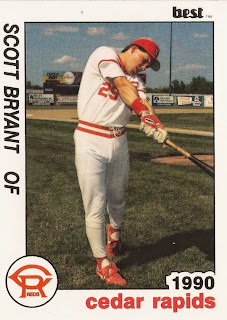 Bryant hit a two-run home run in one May 1991 game, getting the Lookouts out to an early lead. But, by April 1992, the Reds gave up on their former No. 1 pick, sending him to the Cubs for another first-rounder, Ty Griffin. Bryant spent much of that year for the Cubs at AAA Iowa. It was the first of six organizations Bryant would play for through 1996. He played for the Expos at Ottawa in 1993; the Mariners at Calgary in 1994, the Athletics at Edmonton in 1995 and then the Mariners again and the Rangers in 1996. A Bryant home run helped Ottawa to a late-season win in 1993, another home run in a May 1994 game with Calgary proved the difference in a 4-3 contest. 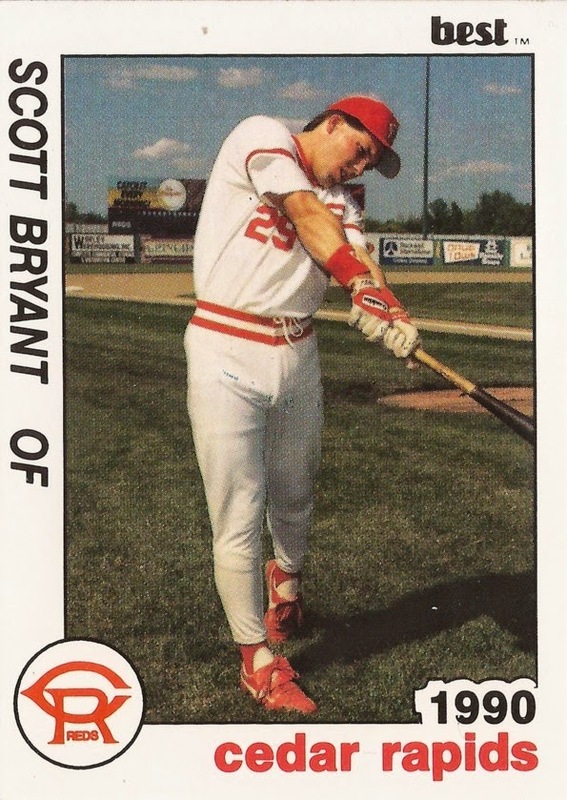 In June 1994, Bryant collected five hits in a 19-5 Calgary win. He again collected five hits, two of them home runs, in an August contest. Bryant finished out his career in 1997 with the independent St. Paul Saints. The occasion for his comments last year to the Texas Media Relations department was the retirement of his old Longhorns No. 25. Other numbers retired in 2009 were those of Brooks Kieschnick, Greg Swindell and Burt Hooton. Bryant set several records at the school, including most doubles in a season, most total bases, most RBi in a season and most doubles in a game. He still holds those four. "To think about the talent that comes through the University of Texas and has been there the last 20 years and that my records are still standing, is very surprising to me," Bryant told the relations department. "And who knows how much longer they'll be there, but it's nice to know that they are still there at this time."